Thank you for inviting me to your lodge, it is not quite what I expected. Of course, my pleasure! What do you mean, it’s not what you expected? You expected a lodge that you humans build in luxurious resorts probably. Well, let me tell you that a beaver’s lodge is normally a big pile of wood, debris, twigs and soil. Like this one, it can be several meters wide. I chose to build it here with my family, since it was not possible to make a burrow in the river banks. Normally we live there, after we dug out a couple of chambers in the banks. And does your family like where you live? Sure, I built it together with my husband, we’ve known each other for several years now. I can think of another beaver I would rather spend my life with. We have two more kids around, but we have enough space. And if my kids grow up so, we have two options. The kids can start to make a new home elsewhere, or we expand our lodge and build our dams higher. On the contrary, my dams have been a great help for many other species around here. I created the dam to have the entrance to our lodge under the water level. That prevents many other animals from entering, so we have a safe place. The wetland that was formed with my dam, is providing a new home for the fish that you see here. The amphibians were also very happy with us, even the water shrews came to thank me. And when we leave this place, the otters already told me they would like to use our lodge as a second home, isn’t that green thinking? It’s like I designed a whole new community, like a real architect. More like a landscape architect, you mean? You can take a look around and see how the surroundings changed. Because of my dam, I created a lake. Because of the lake, trees standing in there died off. This enabled water plants to grow and provides many species with new homes. On the banks, I chew down trees regularly. I love those willows and cottonwood trees. And because the trees disappear, I see the riparian vegetation also change. Everybody, including humans, should be happy that we are still around. Back in the old days, my family used to have millions of individuals, but many died and only a few thousand survived in Europe. Some of my friends were killed by the wolves, like what happened in Königsbrücker Heide Wilderness. But most of my family was hunted, because humans liked our fur or to eat us. They had to eat fish, and those dummies thought we were fish because of our scaly tail. Well, let me tell you: I’m not a fish. But you feel like a fish in the water, right? Almost, I am quite adapted to living in the water. My hind feet are webbed, I can use my flat tail as a propeller, and my fur is thick and isolating against the cold water. Even my eyes, ears and nostrils are placed higher on my head, so that I can see everything when I’m swimming. It’s like we are a better version of a fish. Do you also eat fish? No, I am totally vegan. My meals are mainly tree bark, twigs and leaves. During the summer, I also like to eat grasses sedges and aquatic plants though. I don’t brush my teeth very often, you can see they are quite yellow and curved. But that is very useful when I chew down these trees around here. Did you know my teeth always keep growing? Because I chew so much, I keep them sharp and prevent them from growing too long. 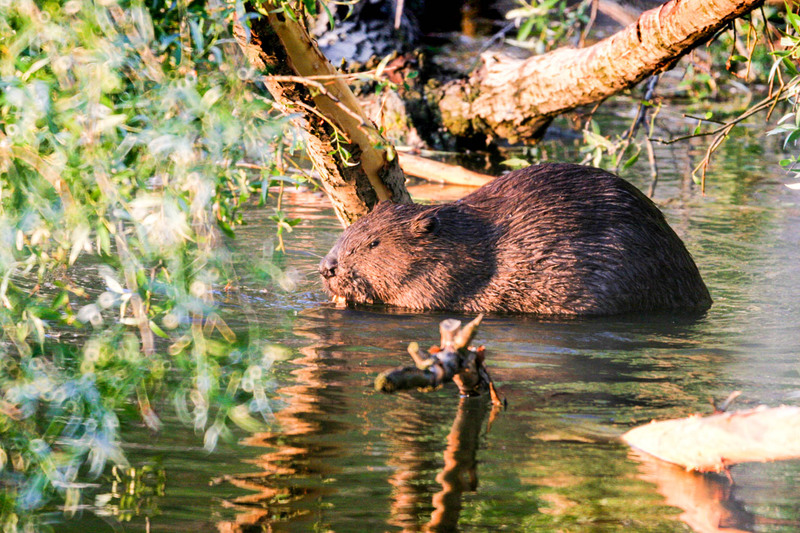 The beavers almost disappeared because of humans, but luckily, they realised something had to change. People started reintroduction programmes in the 1920s, and now we are again with approximately 700,000 beavers in 24 European countries. And we are also protected by the Bern convention that you humans created, thank you for that! Curious to read more? Click on the interview with the brown bear, wolverine, wolf, lynx, golden jackal and bison!